As part of the launch of Spectacular Optical’s book YULETIDE TERROR: CHRISTMAS HORROR ON FILM AND TELEVISION, British writer/director Sean Hogan will be shooting an original short fright film tied to the holiday, which is currently seeking fan funding at Indiegogo. RUE MORGUE got some words from Hogan about the project and Britain’s tradition of spooky Yuletide entertainment, along with the new poster for the movie. YULETIDE TERROR, edited by Paul Corupe and Kier-La Janisse, is a compendium of essays and reviews covering the history of Christmas screen scares (including—full disclosure—a piece by yours truly on SILENT NIGHT, DEADLY NIGHT). 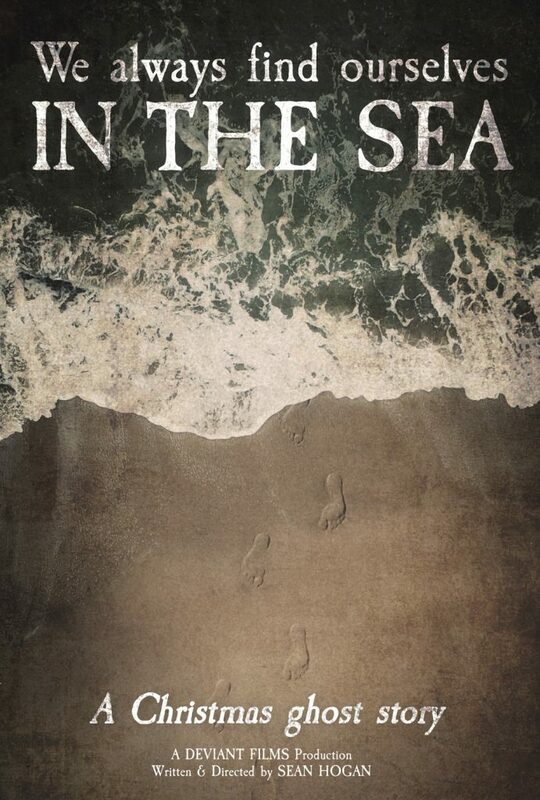 These include the spooky BBC shows that aired on British TV in decades past, to which Hogan’s WE ALWAYS FIND OURSELVES IN THE SEA, set to be shown at book-launch events in November and December ahead of its on-line premiere on Christmas Eve, is a direct homage. You can find more info on the book and movie, and the many perks available for backers, at the Indiegogo link above. How did you become involved with the YULETIDE TERROR project? The roots of it go a little way back. Kier-La Janisse and I had been friends for years, and she would sometimes crash on my couch when visiting London. We’d often end up watching movies while she was staying, but Kier-La being Kier-La, she’d already seen most things of interest. So one time, she asked me to show her something she hadn’t seen before, and I came up with the series of Christmastime BBC TV adaptations of M.R. James short stories made throughout the 1970s, which she knew nothing about and proceeded to fall in love with. She went on to write about them for Video Watchdog, and it became a shared thing for the two of us; I remember how excited we both were when the BBC made a new one in 2013, Mark Gatiss’ THE TRACTATE MIDDOTH. Kier-La ended up working for FANGORIA at one point and tried to interest them in funding a short Christmas ghost story as a way of driving web traffic, but ultimately, the publisher didn’t see why he should have to pay for it. So it went to sleep for a little while, but when she decided to do the YULETIDE TERROR book, she came back to me and asked if I’d make something to tie in with the publication. I obviously leapt at the idea! Has Christmas horror always been of particular interest to you? It’s not so much that Christmas-themed horror interests me per se, but I am a great lover of the Christmas ghost-story tradition. It has fallen away in recent years, but certainly the BBC used to play a big part in this, not just with the James adaptations but also stuff like THE STONE TAPE and SCHALKEN THE PAINTER, which were both broadcast during the holidays. I’m a big fan of James anyway, but there was something about the BBC adaptations that really clicked with me. I think it was partially their economy of means; the budgets were limited, so they were forced to rely on atmosphere and imply more than they showed, which has always been a mode of horror that works for me. I find some of the ’70’s productions, like LOST HEARTS or the adaptation of Charles Dickens’ THE SIGNALMAN, frightening even today. The juxtaposition of creepiness against the pervading sense of Christmas spirit just works for me. How does WE ALWAYS… specifically tie in to the holiday? While many of the productions we’re harking back to didn’t actually tie into Christmas narratively, Kier-La wanted us to have that specific theme, and I was happy to run with it. Some of the most famous James stories/adaptations are set on lonely stretches of English coastline, and I definitely wanted to do something along those lines. I also find the UK coast a very melancholy place to be during the winter, so the thought of setting the story during Christmas tied in perfectly. The film concerns an alienated middle-aged man living alone in a seaside town on Christmas Day, who first receives a strange present—and then an unexpected visitor from his past, which initially promises to ease his loneliness. But of course, events gradually take a darker turn. What other talent do you have involved with the short? I’m making WE ALWAYS… with my friends from Deviant Films, the company with which I produced the recent documentary FUTURE SHOCK! THE STORY OF 2000 AD. We’re all old friends and had a great time making the doc, so we’d been looking for something else to work on together. The cast will include Billy Clarke, who did a brilliant job starring in my feature THE DEVIL’S BUSINESS, and Jamie Birkett, who was part of the ensemble for THE GHOST TRAIN DOESN’T STOP HERE ANYMORE, an anthology horror play I recently directed in London. Jamie’s an award-winning stage actress, and I’ve been looking forward to getting her involved with something on screen. Why do you think Britain, more than America, has a tradition of tying Christmas to horror? I’m not quite sure where that tradition originally comes from, but certainly writers like Dickens and James were well aware of it; James started writing his ghost stories specifically to be read around the fire on Christmas Eve. Certainly when I was a child in the ’70s, Halloween was always considered a very American holiday and not much celebrated in the UK, so I suppose we got our fix of creepiness during Christmas instead—two for the price of one! There does seem to be a certain identification of the tradition with Victoriana, in which case you’d think the U.S. might possibly be attracted to the idea, given the apparently insatiable appetite for English costume drama on this side of the pond. But as I said, there has been a dearth of it—on TV anyway—in the UK during recent years, so it might be a tradition we’re in danger of forgetting ourselves. Hopefully, the book and the movie might play some small part in helping to remind people. While the film will lack some of the usual trappings of the subgenre—it’s modern rather than period, for instance—I am committed to making something squarely in this tradition that I’ve loved for years; something drenched in mood and atmosphere, aiming for a sense of disquiet and dread rather than a succession of “boo” moments. So if that’s at all your thing, please support the whole project. We’re all doing this for the love of it, and it can only work if other like-minded people join in and help make it happen.